Eight-cylinder cars A completely new Gordini was a novelty, and the T32 straight eight unveiled at Montlhery late in the summer of 1955 looked promising. 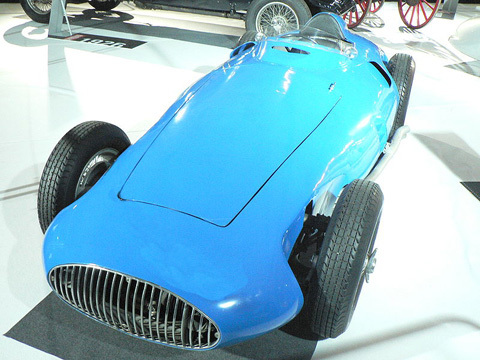 Gordini clung to a ladder-type tubular chassis, but used independent suspension all round and the Messier disc brakes that had been brought in on the late sixes. Its straight eight (75 x 70mm, 2498cc) was the last of the type in a formula car and was initially rated at 250bhp, although that figure was revised down at the end of the year. It had a corpulent body, which was smooth only until the realities of racing called for revision. Only two were built, and they proved large, heavy and uncompetitive. The Gordini eight was last seen at Pau early in 1957. Drivers: Elie Bayol, Andre Guelfi, Robert Manzon, Andre Milhoux, Andre Pilette, Hernando da Silva Ramos. Bayol practising at Monaco in 1956. This car has the original full-width nose (a more conventional one was later devised) and the shortest of the three, types of exhaust used - the longest extended almost to the rear wheels. The outlet for under-bonnet air (below the mirror) was added in 1956, as was the intake alongside the cockpit for inboard rear brake cooling air.